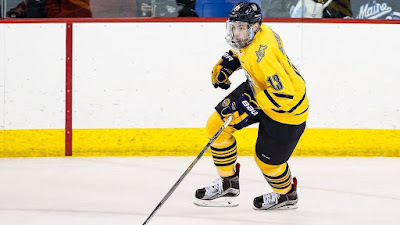 Rising Quinnipiac Bobcats sophomore defenseman Chase Priskie was named the 45th captain of the program by his teammates and coaches for his junior season as announced by head coach Rand Pecknold at the teams annual postseason hockey banquet where other award winners were also announced. Along with Priskie, senior defenseman Kevin McKernan was named the teams assistant captain for next season. Both players were in the QHockeyBlog poll for who should be the program's next captain. Chase Priskie won with 43% of the vote while McKernan tallied 9% of the vote. Both are deserving of leading the program in the 2017-2018 campaign as the team will have a lot of new faces on the ice. Priskie, a draft pick of the Washington Capitals will be the first junior captain in seven years since Scott Zurevinksi in the 2010-2011 season and only the eighth junior all-time to serve as the captain of the program. Other award winners in the evening were Tim Clifton as the teams Most Valuable Player while Alex Whelan was named the Rookie of the Year. Both Tommy Schutt and Connor Clifton won the Coaches Award and Craig Martin was named the winner of the 7th Player Award. Derek Smith won the teams Academic Award following his win as the ECAC Hockey Academic Award winner. Congratulations to the next captain Chase Priskie and the assistant captain Kevin McKernan along with this year's banquet award winners.